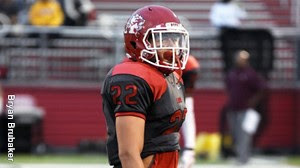 ANNVILLE, Pa. - Albright senior defensive back Kali Boyce earned MAC Defensive Player of the Week for his performance on Saturday in the Lions' 28-14 win over Lebanon Valley in the regular season finale. Boyce had two takeaways, including his sixth interception of the season. Boyce recovered a fumble in the first quarter that led to an Albright touchdown to make it 21-0. The senior also recorded an interception in the fourth quarter with the Lions nursing a 21-14 lead. The interception led to an Albright touchdown that gave the Lions insurance points for a 14-point lead late. Boyce also had five tackles (all solo), a tackle for loss and a pass breakup. He leads the team with six interceptions this season. The Lions are in line to host a game in the Centennial-MAC Bowl Series next Saturday.